Administrators at the Donna School District’s Disciplinary Alternative Education Program, or DAEP, are always looking for new ideas outside of the school’s traditionally high-structured environment to help motivate students. Their latest undertaking is gardening. 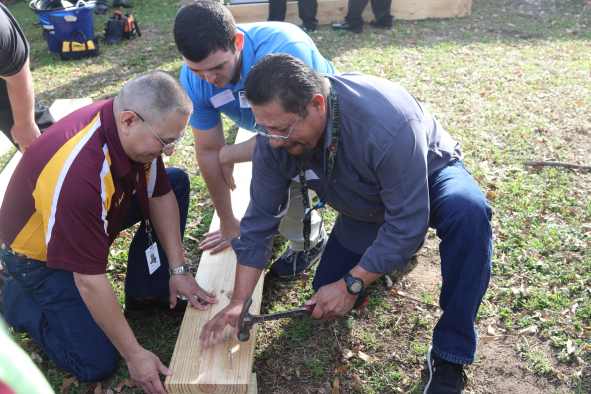 In an effort to prepare their teachers for this new initiative, the school partnered with Texas A&M AgriLife Extension Service and hosted a Gardening Workshop on Tuesdaym Jan. 7. The school’s Principal Juan Mendoza said it was important to him to invite educators from other Rio Grande Valley school district alternative programs so they can also learn other ways to make teaching interesting. Weslaco, McAllen, Edcouch Elsa and Sharyland school districts were also represented at the workshop. The Gardening Workshop was made possible through a grant Donna’s DAEP received from the Texas Holocaust and Genocide Commission (THGC). This year, THGC offered 10 grants of $1,000 to educational institutions to fund projects that promote students taking responsibility and becoming better citizens. DAEP’s social studies teacher Jonathon Figueroa, who submitted the grant proposal for consideration, was excited to learn that his campus was granted funding. Figueroa said while students attending DAEP are there for disciplinary reasons, they need to know that they are valued. Texas A&M AgriLife Community Garden Organizer Ricardo Carranza said students could even see the fruits of their labor end up in their cafeteria and eventually on their plates.